Today was another important milestone for Ohio political watchers and another good sign for Democrats running statewide. Pre-primary campaign finance reports were due, and in all four of the downticket races — for Attorney General, Secretary of State, Treasurer and Auditor — Democrats outraised their Republican counterparts. Furthermore, when today’s haul is combined with money carried over from the last filing period, two of the four: Kathleen Clyde and Rob Richardson–have leapfrogged ahead of their opponents in the amount of cash sitting in their campaign warchests. The same cannot be said in the Governor’s race. 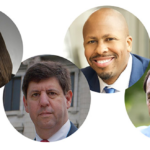 With four candidates running, the top fundraiser, Rich Cordray, couldn’t quite outraise Mike DeWine. But the primary is less than two weeks away and once things shake out, the winner won’t have to compete with other Democrats for contributions. DeWine is clearly spending a ton of money in his effort to defeat Mary Taylor. Another major ad buy went up on the air after the April 18 cutoff for spending that must be reported, but even at his current burn rate, DeWine’s bankroll vastly exceeds that of Cordray. In the other races, all bets are off. Democrats clearly have the enthuiasm advantage there, attracting more contributions for the second reporting period in a row. To review the fundraising of any candidate for state office, visit the Secretary of State’s search page and look for the pre-primary filing report from the committees you’re interested in. Let us know if you find anything interesting.